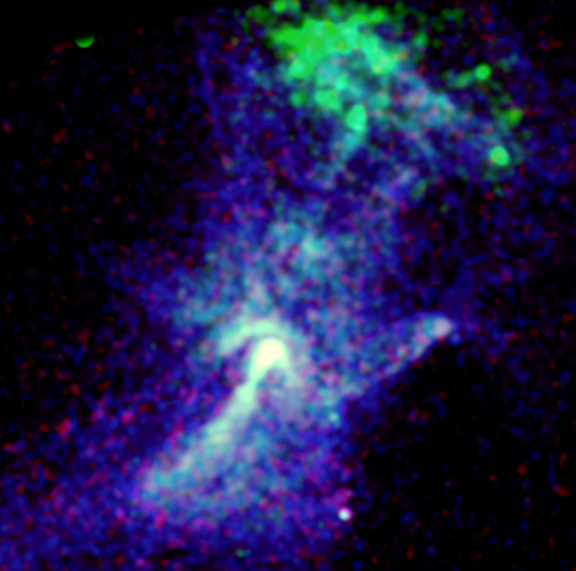 This Chandra image gave astronomers their first view of the energetic and complex nebula surrounding the young pulsar PSR B1509-58. The blue and purple colors indicate X-rays emitted by high-energy particles of matter and anti-matter which stream away from the pulsar. 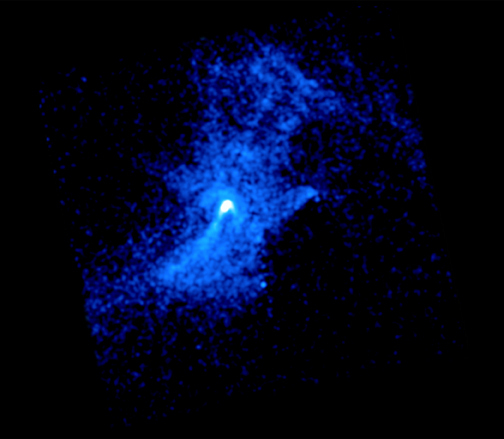 The pulsar itself is the bright white source at the center of the nebula. A thin jet, almost 20 light years in length, extends to the lower left, and traces a beam of particles being shot out from the pulsar's south pole at more than 130 million miles per hour. Just above the pulsar can be seen a small arc of X-ray emission, which marks a shock wave produced by particles flowing away from the pulsar's equator. The green cloud near the top of the image is due to multimillion degree Celsius gas. This gas, possibly a remnant of the supernova explosion associated with the creation of the pulsar, may have been heated by collisions with high-energy particles produced by the pulsar. Scale Image is 10 x 14 arcmin across. Coordinates (J2000) RA 15h 13m 55.60s | Dec -59° 08´ 09.20"